For the de facto leader of Vietnam, see General Secretary of the Communist Party of Vietnam. The President of the Socialist Republic of Vietnam (Vietnamese: Chủ tịch nước Cộng hoà Xã hội chủ nghĩa Việt Nam) is the head of state of Vietnam. Since Vietnam is a single-party state, the President is generally considered to hold the second highest position in the political system, after the General Secretary of the Communist Party of Vietnam. In addition, the president appoints the head of government, the Prime Minister. As head of state, the President represents Vietnam both domestically and internationally, and maintains the regular and coordinated operation and stability of the national government and safeguards the independence and territorial integrity of the country. The President appoints the Vice President, Prime Minister, Ministers and other officials with the consent of the National Assembly. The President is furthermore the Supreme Commander-in-chief of the Vietnam People's Armed Forces, Chairman of the Council for Defense and Security. Moreover, Member of Political Bureau, Standing Member of the Central Military Commission and the Central Police Party Committee. Since September 2011, the President is also the Head of the Central Steering Committee for Judicial Reform. The tenure of the President is five years, and a president can only serve three terms. If the President becomes unable to discharge duties of office, the Vice President assumes the office of acting president until the President resumes duty, or until the election of a new president. The powers and prestige of the office of President have varied over the years. For instance, while the inaugural president, Hồ Chí Minh, was also the Chairman of the Communist Party, making him (in that capacity) the first ranking member of the Politburo, the highest decision-making body in Vietnam, his successor, Tôn Đức Thắng, served as a symbolic figure along with the General Secretary Lê Duẩn. Since Trường Chinh's ascension to the presidency, the President has been ranked 1st (he was sometimes also chairman of the party) or 2nd in the order of precedence of the Communist Party's Politburo except President Nguyễn Minh Triết ranked fourth and President Võ Chí Công ranked third. The current President is Nguyễn Phú Trọng, who was elected by the National Assembly in October 2018 after former President Trần Đại Quang died in office. Trọng is the third person to concurrently serve as head of the Party and State, with the other two people to have done so being Hồ Chí Minh and Trường Chinh. For a more comprehensive list, see List of Presidents of Vietnam. Hồ Chí Minh was appointed Vietnam's first president in 1946 by the National Assembly. Both the 1946 and 1959 Constitutions stated that the National Assembly had the power to appoint and dismiss the President. The President represented Vietnam both internally and externally. The powers and responsibilities of the President remained unchanged in the 1959 constitution. The 1980 constitution transformed the office of head of state dramatically. The office of President was abolished and replaced with the office of Chairman of the Council of State (CC). The CC chairmanship was modelled after the Soviet office of Chairman of the Presidium of the Supreme Soviet. The Council of State, as with the Council of Ministers, was a collective decision-making body. Both the Council of State and the Council of Ministers were part of the executive branch; the strengthening of these institutions weakened the role of the legislative branch. The duties, powers and responsibilities of the Council of State were taken from the Standing Committee of the National Assembly, which lost most of its powers and prestige in the 1980 Constitution. The members of the Council of State were elected by the National Assembly and consisted of a chairman, deputy chairmen, a General Secretary and other members. Council of State members could not concurrently be members of the Council of Ministers. The Chairman of the Council of State was concurrently Chairman of the National Defense Council (later the National Defense and Security Council) and commander-in-chief of the Vietnam People's Armed Forces. The Council of State supervised the works of other institutions, most notably the Council of Ministers, the Supreme People's Organ for Control and the People's Councils at all levels. It also presided over the elections of the National Assembly. The office of Chairman of the Council of State, the head of state, was abolished in the 1992 Constitution and replaced by the office of President. The importance of the President has not remained constant throughout Vietnamese history. For instance, while Hồ Chí Minh was ranked as first member of the Politburo, the highest decision-making body in Vietnam, his successor, Tôn Đức Thắng, was a symbolic figure with little power. The post of head of state was strengthened in the 1980 Constitution by the appointment of Trường Chinh who was, by order of precedence, the second-highest-ranking member in the Politburo, behind Lê Duẩn. The office of President retained the second highest rank in the Politburo order of precedence until Nguyễn Minh Triết was appointed in 2006; he ranked fourth in the Politburo hierarchy. The Politburo elected in the aftermath of the 11th National Party Congress (held in January 2011) by the Central Committee elected Trương Tấn Sang, the current President, the first-ranking member of the Politburo. This was the first time in Vietnamese history where the highest-ranking member of the Politburo does not hold post of either General Secretary or Chairman (was in existence from 1951 to 1969) of the party. Since Trương Tấn Sang is first-ranked member of the Politburo, he is the body's unofficial head. Politburo meetings are held regularly; decisions within the Politburo are made through collective decision-making, and policies are only enacted if a majority of Politburo members supports them. To hold Director of the Economic Council. The National Defense and Security Council (NDSC) is composed of the President, the Prime Minister and other members. The members of the NDSC are proposed by the President and approved by the National Assembly. NDSC members do not need to be members of the National Assembly. The decision-making process of the NDSC is that of a collective leadership. Among its powers is the right to mobilise all forces in the name of national defense, and in case of war the National Assembly can entrust the NDSC with special duties and powers. 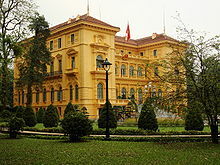 Wikimedia Commons has media related to Presidents of Vietnam. ^ "Vietnam parliament elects Communist Party chief as president". Washington Post. Retrieved 2018-11-05. ^ a b "Political system". Government of the Socialist Republic of Vietnam. Retrieved 20 April 2012. This article incorporates public domain material from the Library of Congress document: Ronald J. Cima (December 1987). Ronald J. Cima (ed.). "Vietnam: A country study". Federal Research Division. Constitutional Evolution. ^ Duong 2008, p. 135. ^ Porter 1993, p. 77. ^ "Party Congress announces CPVCC Politburo members". Government of the Socialist Republic of Vietnam. 19 January 2011. Retrieved 23 April 2012. ^ Staff writer. "Political Bureau". Ban chấp hành Trung ương, Bộ Chính trị, Ban Bí thư [Central Committee, Politburo, Secretariat] (in Vietnamese). Communist Party of Vietnam. pp. I–X. Retrieved 23 April 2012. ^ Staff writer. "Đồng chí Nguyễn Phú Trọng được bầu làm Tổng Bí thư" [Mr. Nguyen Phu Trong is elected General Secretary]. Bao Yen Bai (in Vietnamese). Communist Party of Vietnam. Retrieved 13 January 2014. ^ Staff writer. "Điều lệ Đảng Cộng sản Việt Nam thông qua tại Đại hội đại biểu toàn quốc lần thứ XI của Đảng" [The Charter of the Communist Party of Vietnam which was approved at the 11th National Congress]. 11th National Congress of the Communist Party of Vietnam. Archived from the original on 25 January 2013. Retrieved 23 June 2012. ^ Staff writer. "the president takes the following oath before the National Congress". 13th National Congress of the Communist Party of Vietnam. Retrieved 2 April 2016. Duong, Van Nguyen (2008). The Tragedy of the Vietnam War: A South Vietnamese Officer's Analysis. McFarland. ISBN 978-0786432851. Porter, Gareth (1993). Vietnam: The Politics of Bureaucratic Socialism. Cornell University Press. ISBN 978-0801421686.